Folding mattresses are a versatile and portable alternative to traditional mattresses. A folding mattress is a mattress that folds up for easy storage and transport. Folding mattresses usually have three panels and fold in two places. Folding mattresses are perfect for an extra guest bed, or for kids to take to sleepovers. They’re also great for camping and travel, or just for lounging around in the living room. If you’re thinking of purchasing a folding mattress, you’ll want to know the best mattresses out there, what to look for, and how you might use your new folding mattress. In this guide, we explore all about folding mattresses. This 6-inch memory foam folding mattress might be the best folding mattress on the market. The Milliard 6-Inch Memory Foam Tri-Fold Mattress is made of a 4.5-inch foam base topped with a 1.5-inch layer of memory foam. The memory foam is high quality and dense, so it won’t lose its shape with use. This foldable mattress is ventilated and specially designed to keep you cool throughout the night. This is a feature that many mattresses lack, and it really sets the Milliard 6-Inch Memory Foam Tri-Fold Mattress apart from other folding mattresses. The cover on the Milliard 6-Inch Memory Foam Tri-Fold Mattress is a soft jacquard bamboo that provides superior comfort. The cover on this folding mattress also has a non-slip bottom, so it won’t slide around on hardwood or tile floors. The Milliard 6-Inch Memory Foam Tri-Fold Mattress is available in twin, full, and queen sizes. This mattress is well worth the cost. 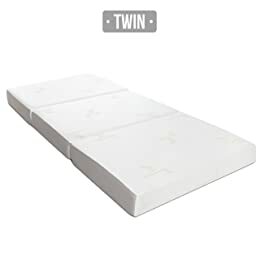 Available in your choice of twin, full and queen sizes, this portable folding mattress from Best Choice Products is similar to the Milliard mattress in that you can fold it up into a sofa bed whenever you don’t need a spare bed. Of course, the twin size is really more of a chair than a sofa when folded, but either way, the fact that this mattress can double as extra seating is definitely a major benefit. Another similarity between this and the Milliard mattress is that the Best Choice Products mattress is also made of four-inch CertiPUR-US Certified high-density foam. This ensures that it provides both the softness and support you need for a great night’s sleep. 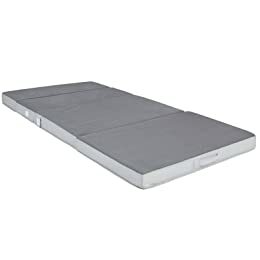 In this sense, you really can’t compare this foam mattress to most other portable beds as there is no doubt that the foam is far more comfortable to both sit and sleep on. The mattress also features a handsome grey, polyurethane cover that helps to resist staining. Still, if the cover ever does get dirty, all you have to do is remove it and toss it in the washing machine. Not only that, but it is also completely dryer-safe for further added convenience. If you’re looking for something that’s far more than just your average portable folding mattress, this Milliard mattress and sofa bed is definitely worth checking out. When not in use, this mattress folds up into a small, floor sofa that can serve as an ideal sitting area for dorm rooms, hotels, tents and camp sites or anywhere else where space is limited. The mattress is made of four-inch CertiPUR-US Certified high-density foam, which ensures that the mattress is strong enough to prevent sagging while still remaining ultra soft and comfortable. The high-density foam construction also provides lightweight durability that makes this mattress an ideal choice for traveling. Another major plus is that the mattress features a removable, machine-washable cover, which means you can simply toss the cover in with the rest of your laundry whenever it starts looking a bit dirty. In this way, you should be able to extend the life of the mattress and ensure that it stays clean and elegant looking for years to come. The fact that the mattress folds into a sofa bed when not in use means you get two useful functions in one outstanding product. One huge advantage of this is that you don’t need to worry about taking up extra storage space when the mattress is not in use as you can always use the sofa to provide extra seating for your kid’s room, den, gaming area, etc. However, this sofa-bed design prevents the mattress from folding up as small as many other standard folding mattresses, which obviously means it will require more space whenever you do need to store it or when taking it traveling. Overall, this mattress is definitely a decent product despite a few minor issues. 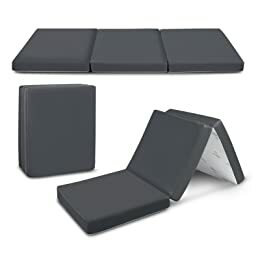 Still, the fact that it is only made out of four-inch foam means that you can definitely find thicker and thus slightly more comfortable options. This isn’t to say that this mattress isn’t comfortable, but only that a thicker mattress might be a better choice for older people or anyone with back problems. This mattress definitely isn’t the biggest one on the market, but what it lacks in size it more than makes up for in comfort and versatility. As with most other portable folding mattresses, this Cozzzi mattress is made from high-density foam that helps to ensure that the mattress is both firm and extremely comfortable at the same time. Moreover, even though it’s not the biggest folding mattress on the market, it should still be plenty big and strong enough to support even a fairly large man with ease. Plus, the smaller size makes it far more portable than many others, and you can easily slide it into your closet for storage or squeeze it into the trunk of your car when taking a road trip. The fact that the zip-off cover is machine washable is also another major advantage. However, it is important to note that the upper face and underside of the cover are made out of different materials. The underside of the cover is covered with a slightly thicker, stiffer material that is designed to help prevent the mattress from slipping and sliding around on the floor underneath you. This is definitely a big plus, but unfortunately, many reviewers report that the material on the underside can begin to fray after only a few uses. Although this shouldn’t cause any major issues, it is still something you might want to keep in mind. Nonetheless, this is really the only obvious flaw, and otherwise this mattress seems like a good choice for a wide variety of situations. At 32 inches wide and 70 inches long, this mattress is similar to a twin size and thus only suitable for one person. However, it just might be one of the top one-person folding mattresses out there. One of the major reasons for this is that this D&D Futon Furniture mattress is made from six-inch high-density foam instead of the four-inch foam used by most other manufacturers. As a result of the thicker foam, the mattress is even firmer, stronger and softer than almost all others. As with other products, this mattress can be folded up into a chair to provide added seating. This is another area where the thicker foam provides a huge advantage. 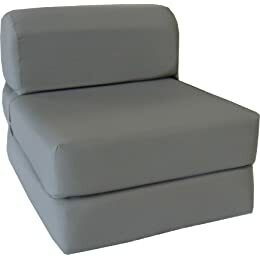 On the other sofa-bed mattresses made with four or four-and-a-half inch foam, the height of the sitting area is only eight or nine-inches tall. However, this mattress folds up into a chair with a 12-inch high seat that not only provides added comfort, but also makes it more suitable for older people or anyone else that has a hard time getting up and down from such a low height. Still, there are a few minor negatives about this product as well. For instance, the backrest on the chair isn’t completely flat. This is definitely a good thing when using it as a chair as it helps to make it more comfortable overall. Nonetheless, it makes it a bit awkward for taller people to sleep on it as this part of the mattress is slightly raised above the rest when folded out to a bed. Furthermore, the cover isn’t easily removable, which means you’re mostly only able to spot clean it. Still, it can definitely be a good choice as long as you are aware about these minor inconveniences. The Sleep Master Tri-Fold Comfort Mat is an excellent memory foam folding mattress. This folding mattress is made from three separate layers of foam to provide extra comfort. 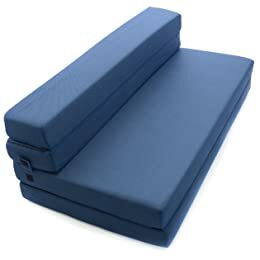 There’s a 1-inch layer of dense base foam for support, 2 inches of regular foam, and 1 inch of high-quality memory foam. The memory foam used in this mattress is a special type created by the manufacturer called BioFoam. BioFoam contains natural ingredients that help to absorb moisture and eliminate odors so the mattress stays fresh. The mattress has a removable and machine-washable cover. This folding mattress is only available in a twin size. The mattress weighs just under 16 pounds, making it easy to carry, although there are no handles. The Sleep Master Memory Foam 4 Inch Tri-Fold Comfort Mat only comes in a standard twin size. This is a 3-inch folding mattress. It is made of polyurethane foam, not memory foam. The high-density foam provides plenty of cushion and support, but it’s not quite as high quality as memory foam. 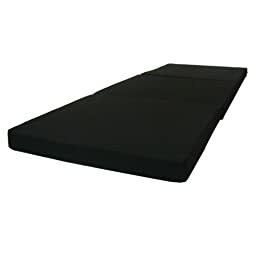 Because the D&D Futon Furniture Black Tri-Fold Foam Bed is only three inches thick, it does not offer as much support as a thicker mattress, however, it can still hold a normal-sized adult without sagging to the floor. The cover on this folding mattress is black and made of polyester. The cover cannot be removed, so you’ll have to stick with spot-cleaning. The D&D Futon Furniture Black Tri-Fold Foam Bed only comes in one size, which is slightly narrower than a twin. This is ideal for small spaces but may not be enough for a larger person. This folding mattress is extremely portable, as it only weighs about nine pounds. It’s an ideal folding mattress for kids or for overnight camping trips, but it’s not the best folding mattress out there. The mattress is a very comfortable folding foam mattress. The top layer is a 0.5-inch of memory foam, the second layer is a 3.5-inch of responsive foam. They make this mattress comfortable for adults to sleep on. The Modway 4″ easily supports your weight without sinking down to the floor. 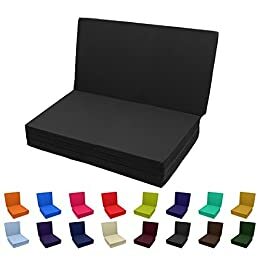 This folding mattress is also conveniently designed to fold into small couch. The Modway 4-Inch Folding Mattress makes a comfortable couch, especially if you’re out camping and want something to sit on around the fire. The mattress is very light, with the twin size weighing just over 16 pounds. This helps to make the Modway Relax Tri-fold Mattress easy to carry. The cover on the mattress has a non-slip bottom and is removable plus machine-washable for easy clean-up. This portable mattress comes in a wide variety of sizes: twin, twin XL, 25″x75″, 31″x75″. The mattress comes with a 10-year warranty. The Magshion Futon Furniture Tri-Fold Bed is a 4-inch folding mattress. This folding mattress is made of polyurethane foam rather than memory foam. The foam is a quality high-density foam, and it’s solid enough to support most adults comfortably without sagging. The Magshion Futon Furniture Tri-Fold Bed comes in a variety of bright colors: light blue, hunter green, khaki, lime green, coffee (brown), black, sky blue, red, burgundy, navy blue, purple, royal blue, dark grey, olive green, pumpkin orange, and teal green. The wide variety of color choices make it easy to find one that matches your décor. 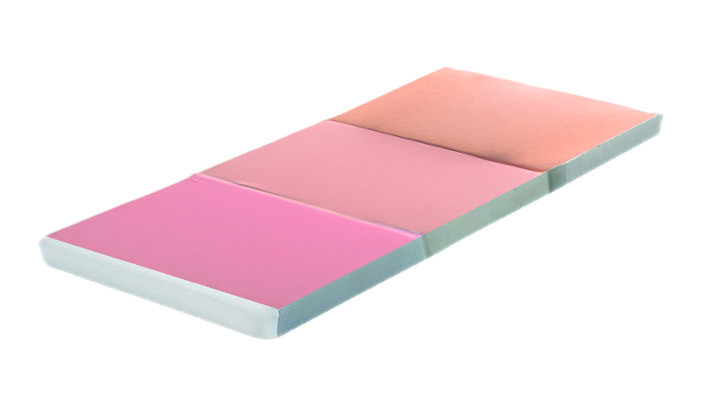 The colors of this folding mattress are also perfect for kids. It’s ideal if you’re buying one for each child to take to sleepovers and birthday parties.The cover has zippers so it can be removed, however, it is not machine-washable. This means you’ll have to spot-clean this folding mattress. The Magshion Futon Furniture Tri-Fold Bed comes in a wide variety of sizes: single (a little smaller than a standard twin size), twin, full, and queen. This is a great folding mattress for kids or to take on camping trips. 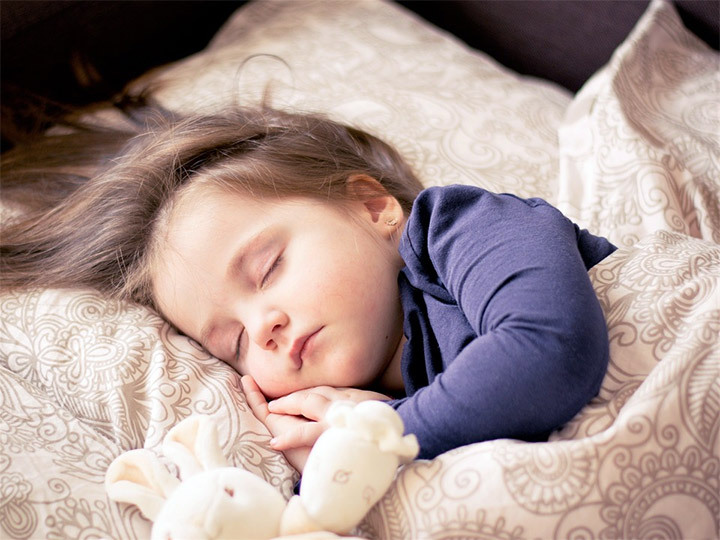 The Milliard Toddler Nap Mat is designed with babies in mind. This is by far the best folding mattress for babies, toddlers, or very young children. The mattress is only 3 inches thick, but since it’s meant for babies to play or nap on, this shouldn’t be an issue. It’s made of supportive foam, which is very dense and comfortable. The cover on the Milliard Toddler Mat is blue and is made of ultra-soft bamboo. It’s hypoallergenic and free of unnatural ingredients and chemicals, so it’s safe for all babies. This cover can be removed and is machine-washable. The Milliard Toddler Nap Mat only comes in one size, and it’s pretty small at 57″x24″, but it serves its purpose well. This folding mattress fits perfectly inside most pack n play playpens, providing extra support and comfort for your baby while they play. You can also set the mattress on the floor for playtime or naptime. The mattress weighs only 5.47 pounds, which is on the light weight side. Matching travel bag can be purchased separately for easy transportation. Folding mattresses are great because they’re easy to store. Most folding mattresses are tri-fold and can easily slide into a closet for safe keeping. Folding mattresses don’t take up a lot of space in your closet. If you’re looking for a guest bed that won’t sit unused when no guests are around, a folding mattress is the perfect solution. Take it out when you need it and fold it up and store it when you don’t. If you travel a lot, a good folding mattress can save you from the pain of sleeping on someone’s couch. A nice folding memory foam mattress is much more comfortable than the average futon, and it definitely beats a saggy couch. Folding mattresses are also great for camping, as they provide a good alternative to sleeping bags. A folding mattress won’t take up too much space in the car, and many models have convenient carrying handles for easy travel. Folding mattresses are much less expensive than traditional mattresses. Even the most expensive folding mattresses are still under $200. Traditional mattresses cost hundreds of dollars, and even air mattresses can set you back a few hundred bucks. There are many cheap options when looking for a folding mattress that will save you tons of money. A foldable mattress can be used for more than just sleep. 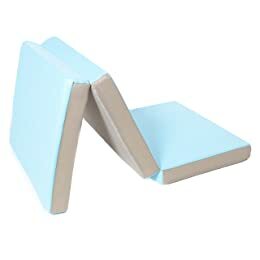 Fold it up all the way to make an ottoman or footrest. Some models can be folded up into a chair. Keep a folding mattress in the living room for lounging on while watching TV. Kids will love using folding mattresses as play mats. They can roll around and play without hitting the hard ground. Most folding mattresses come with removable covers for easy washing, and many are even machine-washable. Kids can also take folding mattresses to sleepovers as a more comfortable alternative to a sleeping bag. A folding mattress is the ideal guest bed, especially if you live in a small space. Guests will be much more comfortable on a folding mattress than they would be on the couch. A folding mattress allows sleepers more room to move around than a couch, and the material is designed for sleeping, unlike a couch. For those who don’t have room for a guest bed, a folding mattress is perfect because it can be stored in a closet until you need it. When guests arrive, just unfold the mattress. Even if you have a guest bedroom, using a folding mattress allow you to have extra storage space when guests are gone. Folding mattresses tend to be more comfortable than other portable options. A good folding mattress will provide plenty of support and allow you to sleep through the night comfortably. Folding mattresses are far superior to sleeping bags for camping or travel. A folding mattress is also much more comfortable for guests than a futon or couch. Folding mattresses provide the full comfort of sleeping in a real bed. When you’re buying a folding mattress, you want to make sure you pick one made of high-quality materials. Most folding mattresses are made of foam. The best folding mattresses are made with memory foam, which conforms to your shape for improved comfort. 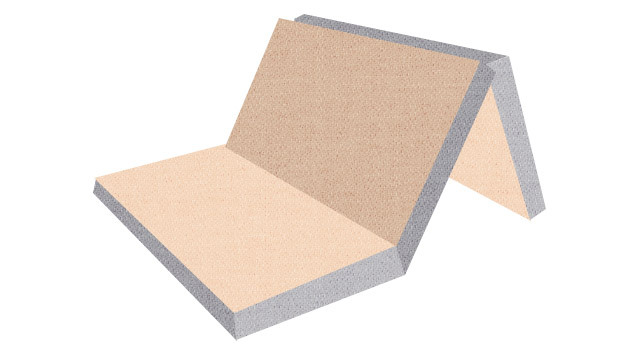 Less expensive folding foam mattresses are made of polyurethane or latex foam. This is good if you’re buying a mattress for kids to play on, but it’s not as dense and supportive as memory foam. A folding memory foam mattress is much more comfortable for sleeping, especially for adults. Memory foam is denser than polyurethane foam and will provide better support. 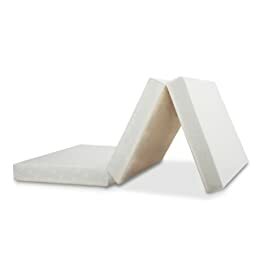 A folding mattress with dense foam will also last longer and won’t sink to the floor when a lot of weight is put on it. 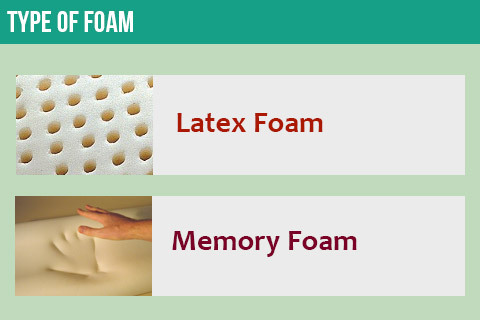 Often, memory foam mattresses are made with memory foam and other types of foam. Make sure you check the specifications before buying a mattress to see how much memory foam you’re actually getting. Before you take the cover off and throw it in the washing machine, be sure to check whether your folding mattress cover is machine washable. A machine-washable cover can be put in the washing machine without shrinking or losing its shape, so it’s easy to wash and put right back on. This is ideal for a kid’s mattress or a mattress that you will take camping, as it may get dirty. You’ll also want to check the material of the cover. If you’re going to take your folding mattress on camping trips, you’ll want a cover made of sturdy material that can withstand the elements. Some folding mattresses have waterproof covers, which is also excellent for camping or kids. If you’re going to be sleeping right on top of the folding mattress, make sure the cover is made of a soft, comfortable material. If the cover is not soft enough to sleep directly on, you will want to make sure the mattress is a standard size so you can easily purchase sheets to fit it. 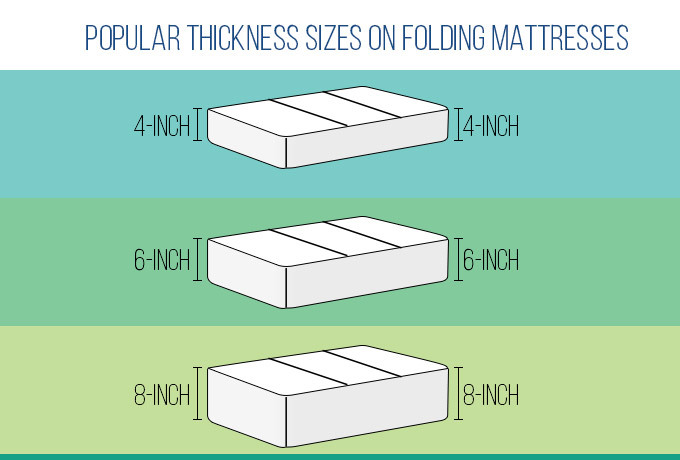 Folding mattresses come in a variety of thicknesses. A thicker folding mattress contains more foam, making it bigger. Thicker folding mattresses are more comfortable for sleeping and provide better support. For larger adults, a thicker mattress may be necessary to prevent the mattress sagging to the floor. The most common sizes for folding mattresses are 4-inch, 6-inch, or 8-inch. Thicker mattresses often cost more than thinner folding mattresses. Weigh the cost of a thicker mattress against its benefits, and consider what the mattress will be used for and how often it will be used. An 8-inch folding mattress will likely be higher quality and last longer than a 4-inch folding mattress. In addition to different thicknesses, folding mattresses also come in different sizes. Most folding mattresses follow the same sizing guidelines as traditional mattresses. A twin mattress measures 38 inches wide by 75 inches long, and is ideal for children. A full mattress is 53 inches wide by 75 inches long, and is ideal for adults sleeping alone. A queen-size mattress is 60 inches wide by 80 inches long, and is a good fit for most couples or adults who like to have a lot of space. A king-size mattress is 76 inches wide by 80 inches long. Most folding mattresses come in twin, full, or queen sizes. Some come in king size, but this is less common. Not all folding mattresses follow traditional mattress size guidelines. Some folding mattresses are intended for children, and may be smaller than a twin. Others simply come in irregular sizes. Check the measurements before purchasing a mattress if you’re not sure. Folding mattresses are intended to be easy to transport. You can fold your mattress up and take it wherever you go. Some folding mattresses are easier to carry around than others. You’ll have to balance factors like comfort and size against how easy the mattress is to transport. Look for the way the mattress folds up. Most folding mattresses fold in two places, making three panels. Remember to think about the size of your mattress and the thickness of the mattress, too. An 8-inch queen-size mattress will fold up, but it will still be fairly large when folded. 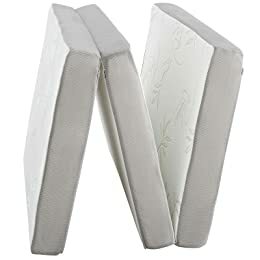 Some folding mattresses have handles attached to the mattress. This makes the mattress very easy to carry. Other folding mattresses come with a bag designed to transport the mattress easily. This is convenient, since it can be hard to find a bag that your folding mattress fits in without a struggle. You’ll also want to see how much a folding mattress weighs. If you’re going to be carrying your mattress around a lot, look for one made of light-weight foam. However, keep in mind that lighter mattresses may contain less dense and lower-quality foam. Folding mattresses are great because they can be used for a wide variety of purposes. Since you can take a folding mattress anywhere you go, you’ll find yourself using it for many different purposes. Folding mattresses are ideal for camping trips. Instead of bringing along a sleeping bag, take your folding mattress on your next camping trip. A folding mattress keeps you from having to sleep on the hard, bumpy ground. It will save you from pain and soreness when you wake up and ensure you’re comfortable on your camping trip. 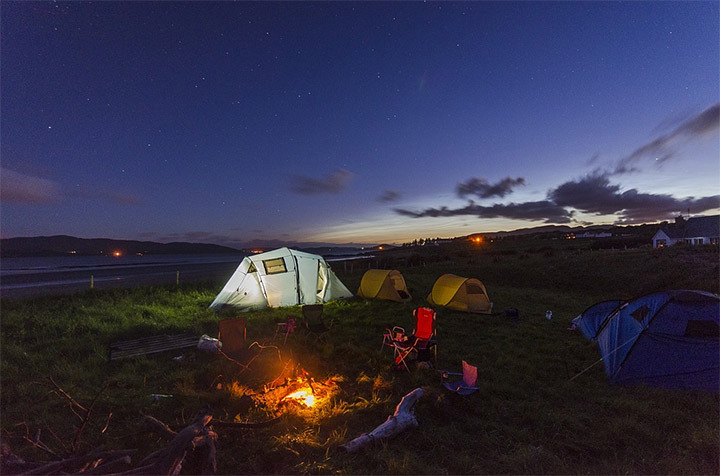 You can also fold up your folding mattress and use it as a seat by the campfire when you’re not sleeping. Kids will love taking a folding mattress with them for sleepovers at friends’ houses. They will be much more comfortable sleeping on a folding mattress instead of in a sleeping bag or on the floor. Folding mattresses are easy to transport, so you can pack it up and send it off with the kids wherever they go. You’ll have other parents asking where you got such a great, portable mattress! If you’re short on space but still want to invite guests to spend the night at your home, a folding mattress is the perfect solution. You can be sure guests will be comfortable sleeping on a nice folding mattress, and they won’t have to suffer through the night on an uncomfortable couch or futon. When you don’t have any guests staying over, you can easily store a folding mattress, so you don’t have to give up any space in your house for a guest bed you’ll hardly use. Many people purchase folding mattresses just for lounging around, snuggling with pets, or watching TV. You can get a full or queen size folding mattress and lay it down in your living room to create a fun lounge area. A folding mattress will allow you and many guests to sit on the floor without discomfort or back pain. Kids especially will love playing and tumbling around on a folding mattress, and you won’t have to worry about them falling onto the hard floor.